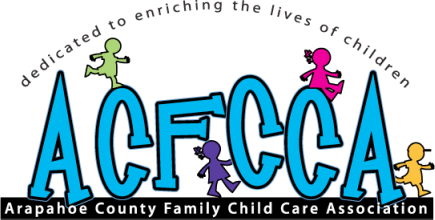 Membership in ACFCCA publicly signifies your personal desire to contribute to the promotion of quality child care. We offer educational opportunities to help you achieve and maintain the professional appearance and attitudes that are essential to the success of your business. Certificates of participation are issued for all our workshops. A membership card will be issued to verify your affiliation with our professional organization. You can show this card when attending workshops given by other counties, to receive their certificate. We offer you support through the Executive Board. If you have questions regarding your business or if you simply need to talk to someone, feel free to call a current board member. A FREE Referral service is provided to all Association members. Volunteers, dedicated to helping you and parents in our community, assist you in filling your current openings. We also offer an opportunity to have your own web page linked to our web site. Our "LIFELINE" newsletter comes to you monthly (excluding May/June/July, November/December combined issues). The contents are association news, Human Services updates, legislative issues, educational opportunities, workshop information, and much, much more!! We offer our members a free accidental insurance policy, and the opportunity to purchase other insurance at a nominal fee. As a member of ACFCCA, we offer you the opportunity to join CAFCC. Through membership with CAFCC you will have many other benefits. All Association dues and costs are 100% tax deductions. 5955 S. Holly Street in Centennial. Our Aurora monthly meeting is held on the third Tuesday of each month from 7-9 pm at Eloise May Library,1471 S. Parker Rd in Aurora, or Smoky Hill Library, 5430 S. Biscay Cir. in Aurora. **Due to a conflict with the library, monthly meetings could occasionally be on a Monday. Please check the website or the newsletter for information. For any questions relating to each of the areas, please feel free to contact Patty at 303-745-6558. Attendance at our monthly meetings is an opportunity for you to meet other child care providers and to receive your required education credits for re-licensing. Attending these meetings is an excellent way to find providers who are willing to do backup or sub care for you and your clients. The elected Executive board meets monthly on the first Tuesday from 7 to 9 p.m.. All board members are required to attend, and the general membership is always welcome. If a board member is not able to attend, it is her/his responsibility to contact the President to give his/her report. A Quorum is required for any voting decisions to be made, at least 51% of the board, not including the President must be present or voting decisions will be tabled until the next meeting. Need further assistance, please contact Patty at 303-246-5146.